Opening: 28th Nov. 2014, 6-9 pm. 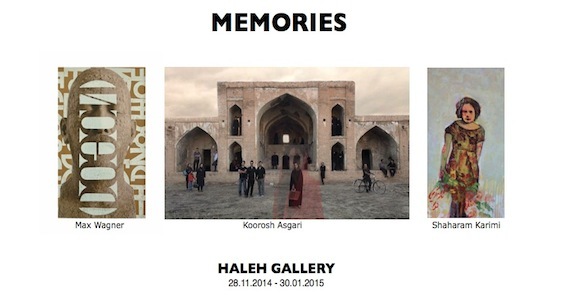 Haleh Gallery is pleased to invite you and your friends to the opening of our next group exhibition “Memories” on Friday, 28, November, 2014 6:00-9:00pm. Memory is identity, a trace of what is left behind. Past memory, present existence and the future are the components of the dynamic creation of identity. Memory is directly related to the present; the perception of the past is always influenced by the present, which means that it is constantly shifting. Memory is not only an individual, private experience, but also a part of the collective domain. The exhibition, MEMORIES, brings together 3 artists who investigate in their works the construction of personal memory through visual images. Shahram Karimi, Koorosh Asgari and Max Wgner depict in paintings, photographs, films and sculptures their natural memory that consists of spontaneously captured experience. Sahhram Karimi and Koorosh Asgari deal both with matters of history of their homeland, Iran. In the last 100 years Iranian society was striving for modernity. During this epoch many artists were forced into exile or were erased from public memory. Detached from time and space, Shahram Karimi’s (*1957 Shiraz, Iran) figures appear to be lost and isolated through floral patterns on the fabrics. Memories of his homeland, Iran, are recalled through the citation of Persian iconography and Persian scripture. Past, present and future are combined and transformed into the poetic imagination. Koorosh Asgari tells, in his video Shahrzad, a contemporary woman’s struggle for equality in a patriarchal society, which is marked through longstanding traditions. In the context of the story of liberation her struggle leads to neglect and injuries from society and family. In his sculptures, “Selbstversuch”, Max Wagner examines the randomness of cultural identity and national belonging. He plays with the idea of earlier or subsequent identitities. The concept of memory is the connecting link of the works by Koorosh Asgari, Shahram Karimi and Max Wagner. Past memory, present existence and the future shape their dynamic creation of identity. Shahram Karimi (*1957, Shiraz, Iran) lives and works in Germany, Iran and New York. Shahram Karimi employs multimedial means of artistic expression, painting, installation, video, etc. Film Production design in collaboration with Shirin Neshat and Shoja Azari (among others). Various solo- and group exhibitions (selection): Roots (2013) Haleh Gallery, Magic of Persia, Dubai (2012), Art Cologne, Art Dubai, Art Paris. Koorosh Asgari (*1972) is a photographer, lives and works in Tehran. House of the artists, Tehran (2010); Gabbiano Gallery, Rome (2010), Haleh Gallery, Berg am Starnberger See, Germany (2012), amongst others. Max Wagner (*1956 in Straubing) worked as an archeological illustrator (1976-1979) and studied sculpture with Erich Koch at the Academy of Fine Arts Munich (1979-1985, diploma). 1985-1989 he was an assistant to Erich Koch at the Munich Art Academy. He has worked as a free-lance artist since 1989 and is a member of Münchner Secession (Munich Secession). In 2004, he was awarded the Landkreis Starnberg Cultural Award.